Our mission is to develop a vibrant fish processing and export business focusing on East Africa, Middle East and beyond. Yustan is run by an experienced management team that maintain effective risk management and compliance practices,. Our guiding principle is the continued assurance of quality, service, pricing and punctual delivery of premium seafood products. According to the FAO, the only fish stocks in the world that are actually “underfished” are in off Somalia’s coast. By working closely with our suppliers to ensure sustainable fishing practices our business sets the stage for the development of an ethical fishing sector. Creating job opportunities in Somalia and Ethiopia by providing a ready market for abundant Somali sea-food. 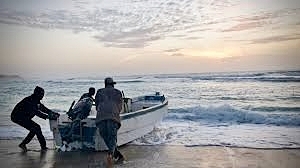 Working with fishing cooperatives in Somaliland, Puntland, and South Central Somalia to ensure fair pricing for fishermen. Work closely with stakeholders to increase entrepreneurship opportunities for Ethiopians. Improving access to equipment and technical skills to ensure high-value catches for fishers. Collaborating with Somali stakeholders to ensure increased investment in renewable energy, processing and cold storage(ice-making/freezing).